General Motors Co. was one of the earliest supporters of the decade-long odyssey to build a memorial honoring the Rev. Martin Luther King Jr. on the National Mall. At $10 million, GM and the General Motors Foundation was the largest donor to the $120 million memorial that opened to the public Monday. Other automakers and their foundations also stepped up: The Ford Foundation and Toyota Motor Corp. each gave $2 million, Hyundai Motor Co. $1 million and Honda Motor Co. $500,000. The Michigan-based W.K. Kellogg Foundation also was among the largest donors, giving $3 million. GM Chairman and CEO Dan Akerson and clothing designer Tommy Hilfiger, whose company donated the second largest amount, will be among those speaking at Sunday’s dedication ceremony, which will be led by President Barack Obama. “This is an important moment in our nation’s history, and we hope this memorial will inspire others to turn their own dreams into action,” Akerson said in a statement. The Detroit-based automaker, whose headquarters is in America’s largest majority African-American city, took a special interest in the project. 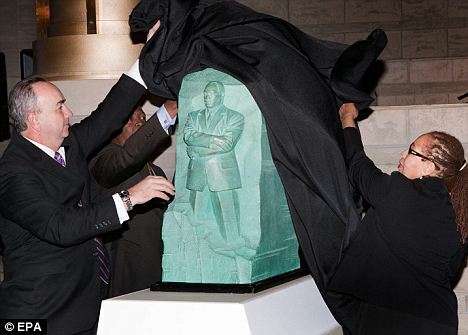 “The GM Foundation and General Motors were among the first to contribute to the legacy of Dr. King by sponsoring this important memorial,” said Harry Johnson, president and CEO of the Martin Luther King National Memorial Foundation. GM has been working on the memorial effort since around 2000, when the proposal to support it was presented to GM’s CEO Rick Wagoner and North American President Gary Cowger by Rod Gillum, a former vice president of corporate responsibility and diversity at GM and chairman of the GM Foundation. Cowger has co-chaired the memorial’s Executive Leadership Council since 2003 and spent years working to raise money and persuade other corporate executives to donate. He retired from GM in 2009. Gillum, co-chairman of the memorial foundation’s board, said the economic climate made fundraising tough, but he had no doubt the project would succeed. He noted GM is widely credited as the first major corporation to have an African-American director: the Rev. Leon Sullivan, who joined GM’s board in 1971. He noted that UAW President Walter Reuther spoke with King at the 1963 March on Washington, and Reuther lent King office space in Detroit in 1963. “He was the leader that supported Dr. King when many in the labor movement didn’t,” Bob King said. He added that the civil rights leader is a personal hero and said he tries to model his life on King and Reuther. “I read (King’s) speeches. I go back and read his speeches,” he said. The auto industry fanned the migration of 1 million Southern African-Americans to the North. In 1910, 1 percent of Detroiters — 5,741 citizens — were African-American — and 25 of 10,000 auto workers were black, according to the University of Michigan Bentley Historical Library. By 1930, the number of African-Americans living in Detroit jumped to 120,000 as automakers and other factories sought new workers. But early African-American workers often had the worst jobs in auto plants. Many GM executives will take part in events all week in Washington, including GM North American chief Mark Reuss, who will speak at a star-studded gala dinner Saturday. GM’s Chevrolet brand is sponsoring a “Table of Brotherhood” four-city tour to bring people together to discuss King’s legacy, as well as issues such as education, the economy, health care, and cultural diversity and tolerance. The talks include events in recent weeks in Memphis, Tenn.; Chicago; and Atlanta — as well as Friday in Washington — and have included film director Spike Lee; U.S. Rep. John Lewis, D-Ga.; and everyday people having conversations about race.